272 teams, Head Judges Riccardo , Edwin Zhang . I applied for this event wanting to go internationally to a challenging event, it was also a great opportunity to reunite with judges from across Asia. Being both team sealed and in another language it had the potential to be what my phone likes to autocorrect to “a cluster of ducks”. It turned out to be one of the smoothest GPs I’ve judged at, and I was actually slightly disappointed nothing exploded. As important as always, I’m only noting it because I was so impressed with Riccardo ’s pre-event communication. He gave this event the briefing and preparation it needed. Before the event we had a detailed plan of the challenges we’d face and what each team was responsible for. Friday night we had an extensive team leader (and scorekeeper) meeting going over the many details of team sealed, with a solid plan to deal with a lot of teams coming to the scorekeeper with issues at the start. We ended up with not a single team having an issue! 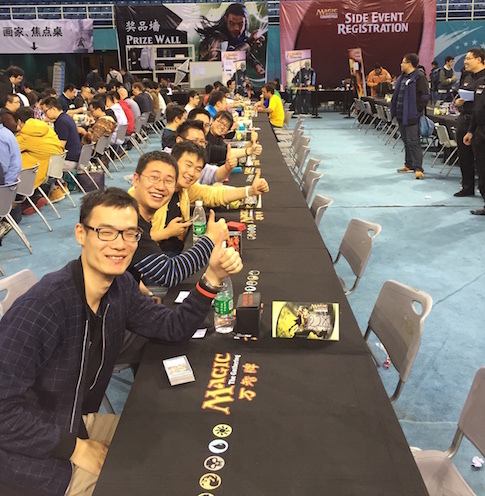 He and Edwin Zhang put a lot of effort into their start of event player announcements, to make the new process clear. The TO did a few great things that saved a lot of judge time and potential player confusion. – They had already marked all the boosters for the main event with a sticker, so players couldn’t sneak in their own rigged boosters. – There was no VIP/Sleep-in option, nor any preregistered pools (with no byes at team events there’s less incentive for TOs to do these). These two points would’ve taken a heap of tedious judge time to make up. – Wristbands for players; Avacyn in white, Braids in black and Chandra in red. 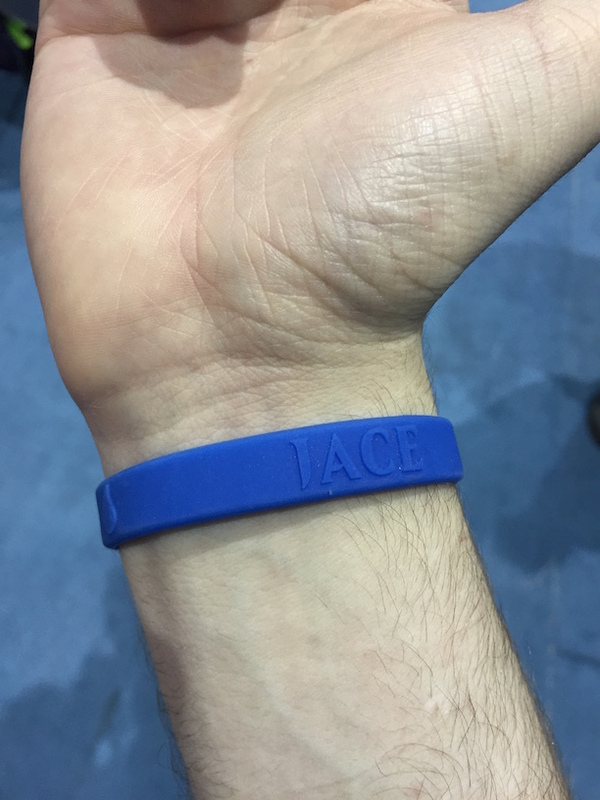 Most players happily wore their corresponding band, so they could easily match up with the opposing team, avoiding tardiness penalties to two players on the team. 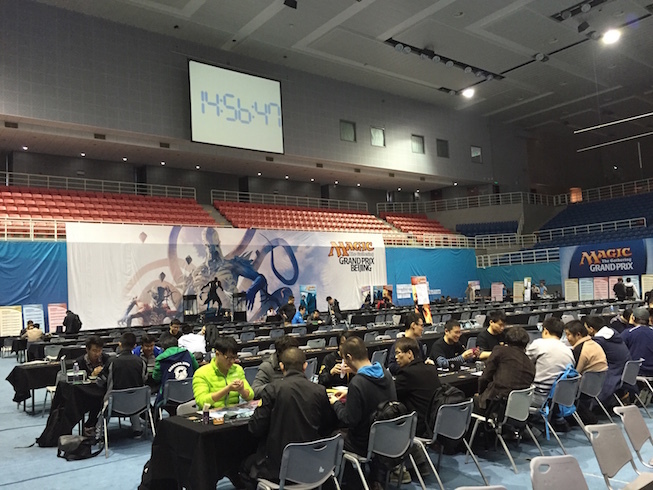 Team sealed is paired with a table for each player, but it’s still an easy mistake to make. Getting an individual physical reminder on the Friday makes it harder to forget your assignment as well. There was also Surrak in green for staff, and Jace in blue for judges. One of the other L3s had the suggestion we add A/B/C to each table number tent, as another indication to players if they’re sitting in the wrong seat. 1a, 2b, 3c, 4a, 5b etc. Riccardo had the idea that instead of putting name ranges (“A-G” etc) on the wall that we should print out all the letters of the alphabet and put them up. The idea was that players who don’t often use the English alphabet may not quickly know that “F” is in the range “A-G”, but could easily spot a big letter “F”. Friday night a seat all was printed as a test, with the pages being spaced evenly to let the most players see them, then the letters being put up above the corresponding pages. As a surprise Edwin Zhang arranged delicious gelato to be delivered halfway through the day, it lifted spirits a lot. At GPs I always like to bring a block of chocolate or a bag of snacks to offer people some during the day, a little delicious surprise always helps. We were in a university gymnasium, with carpet laid down over the court. It was comfy but also bunched up a lot so we had to be careful to reduce tripping hazards a few times by taping it down. It also made moving chairs very hard, there wasn’t anything we could do about this. One of the biggest surprises of the weekend for me was the vast amount of rubbish players were leaving on tables. Every round we were doing laps and grabbing countless empty bottles/cans and there were piles of cards from players opening boosters and leaving commons. There were many bins around the room, including small ones at the end of each row, so I think this was a player attitude issue, and it would’ve lead to some Unsporting Conduct – Minor, had I actually seen any of the people doing it. Throughout the weekend everyone made good use of landmarks in their instructions. “to the left of the stage” or “where I am/on my left” aren’t nearly as helpful descriptions for a player as “at the Ajani banner”. For the deck swap the instruction “all players facing Ulamog, open your boosters” was used, which is very hard to mistake. We also had the best clock I’ve seen! There was one at each end of the venue. We had an unusually high number of no shows to matches in the GP. I believe this may be partly player inexperience at large events, but it’s also much harder to assemble your team for the next round once someone has said “screw it, we’re done”, and more tempting to just leave, given that you’re already together with friends. It’s important at local events to educate players on how to drop, it’s a common question I get, as many players don’t use result slips frequently. Players coming up to me to drop at our FNMs (which don’t use result slips) always get a “thanks for letting us know”, as a little positive reinforcement (carrots!) and thanks for not leaving an opponent hanging. In one round we had an entire side of a row missing, except for the Brazilian judge team battling on! The start of the day went very smoothly, 160 players finished pool registration with 6+ minutes to spare, after their quick booster opening. I think this was partly due to *very* concise announcements in both English and Chinese, but mainly that they’d all just done it yesterday. I made a point to thank all the players for being so fast as we swapped back early, telling them “thank you all for being fast, we will all go home a little sooner tonight”. We have a lot of sticks for players in the form of penalties, it’s important to also reward players when they do well, even just a simple acknowledgement and thanks. Investigation – Extra Sideboard Cards? Round two of the Super Sunday Sealed one of the judges who was doing a start of round deck check came up to me with something that needed investigation. He told me that when he grabbed the decks he’d asked for the deckboxes, one of the players, Tibalt, was quite edgy and questioned why we needed to see it, but had reluctantly handed it over. That box contained 6 extra cards in the same sleeves as the deck. 4 good commons and 2 ok rares in that player colours that weren’t on the list, that he said as he handed over the box “he’d had leftover from yesterday and had just put there”. At this point all the interactions except between me and the judge had been in Chinese, and I’d need the judge to help translate during the investigation, which meant it could take a long time. Given it seemed pretty shady and I was fairly sure there would be at least be a game loss for D/DLP I wanted to give it all the time it needed to look into things further. We quickly checked through the player’s deck and there was no issue other than the extra cards with the sideboard. We found the player’s round 1 opponent and asked if he’d seen any of those cards. If he’d seen them it would’ve been very hard for Tibalt to convince me he wasn’t cheating. He was pretty sure he hadn’t seen the cards but noted that he got manascrewed, so hadn’t had long enough games to see much. Inconclusive. The player didn’t have the extra cards on the list, so they presumably wouldn’t try and claim they were part of the original pool. We didn’t speak to the player who registered the pool. We went back to Tibalt, and pulled him aside from the table to talk. I asked what the cards were, again, this was all through the judge translating. He said that they were cards he wanted to keep from yesterday but he only had his deck box to keep them in. He seemed very calm and said he was a little confused about us taking his deckbox too as he’d pulled his sideboard out of it to present with his deck. I pulled the judge aside and he confirmed that was true. It was something I should have double checked at the very start, and either the judge had left it out, or more likely I’d misunderstood and hadn’t checked. Now the most likely story seemed to be exactly what the player said, they had some extra cards around, but had made sure they presented their sideboard clearly to avoid problems. There was nothing that seemed to contradict this. We ended up with an 18 minute time extension and no infraction, we hurriedly got the players playing again. We kept a judge nearby to make sure they were playing quickly, fortunately they finished just as time was called. It was a great weekend for meeting new people, and seeing friends I’d made from around the world I hadn’t seen in awhile. If you haven’t done an international GP I encourage you to look into it, do some research and there’s lots of cheap flights out there. Hopefully I’ll see some of you at GP Melbourne in March!